Today we are again presenting you the most updated Oneliner GK Current Affairs Notedown Points from 11 January 2018. These Notedown Oneliner consists of News & Events with Important GK Points from which basic questions were arrised. We can assure all our readers that we are the first to provide you with the most recent news with best quality. However we allow all ours users to crosscheck our content. 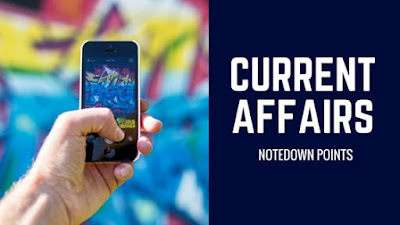 If you find any outdated notes please infom us as soon as possible. Cabinet approves amendments in FDI policy. FDI policy further liberalized in key sectors. Civil Aviation - 49% FDI Allowed. Construction Development - 100% FDI Allowed. Power Exchange - 49% FDI Allowed. Government approval no longer required for FDI in Single Brand Retail Trading (SBRT). Extant FDI policy on SBRT allows 49% FDI under automatic route, and FDI beyond 49% and up to 100% through Government approval route. It has now been decided to permit 100% FDI under automatic route for SBRT. India will launch ISRO’s 100th satellite along with 30 others in a single mission on January 12 from Sriharikota, in a milestone event in the country’s space history. The Indian Space Research Organisation (ISRO) said it was “back in the game” with the launch, the first Polar Satellite Launch Vehicle (PSLV) mission after the unsuccessful launch of the navigation satellite IRNSS-1H in August last. Flipkart’s payments arm PhonePe said it has partnered mobile wallet company FreeCharge to allow the latter’s customers pay for transactions at PhonePe’s partner merchants. According to the deal terms, PhonePe has now enabled its over 45 million users to link their existing FreeCharge wallets to the PhonePe app. Karnataka topped all states with investment intentions of Rs. 1.49 lakh crore till October 2017, which was 43 per cent of the country's total investment intentions, said R V Deshpande. Addressing the third meeting of Council for Trade Development and Promotion at New Delhi. Professional player Aditya Mehta won the Kolkata Open 2018 International Invitation Snooker Championship by defeated Englishman Professional Player Alfie Burden 5-4. here at Hindusthan Club in the citytoday. National Payments Corporation of India (NPCI), an umbrella organisation for retail payment systems in India, has appointed Dilip Asbe as Managing Director and CEO of the organisation by replacing AP Hota. World Bank said India has huge potential, Likely to projects 7.3% growth in 2018. Aanchal Thakur, The 21-year-old Manali resident clinched bronze in the coveted Alpine Ejder 3200 Cup organised by the Federation Internationale de Ski — skiing's international governing body — at the Palandoken Ski Centre in Erzurum, Turkey. She won the medal in the slalom race category. State government of Bihar bans electronic cigarettes, The notification was issued by the State drug controller (SDC) Ravindra Kumar Sinha recently and was also sent to all the assistant drug controllers (ADC) and drug inspectors for its strict enforcement in their areas. Country's largest lender State Bank of India plans to raise up to USD 2 billion (over Rs 12,600 crore) by issuing bonds in US dollar or other convertible currency. Benami transactions to attract jail term of up to 7 years. SanDisk unveils prototype of world's smallest 1 TB flash drive at CES 2018. Bhopal railway station in Madhya Pradesh has become India's first railway station to have a sanitary napkin vending machine. The machine named 'Happy Nari', installed by the Railway Women Welfare Association of Bhopal, dispenses two sanitary napkins for ₹5. CEO of Paytm: Vijay Shekhar Sharma ,He is an Indian entrepreneur and founder of mobile payments company, Paytm. Sharma is India’s youngest billionaire. Governor of Karnataka: Vajubhai Rudabhai Vala. Snooker is recognised from IOC, Highest governing body: World Snooker Association. Headquarters at: Bristol, United Kingdom. Chairman of PNB (Punjab National Bank): Sunil Mehta. Headquarters of PNB (Punjab National Bank): New Delhi. Full form of NPCI: National Payments Corporation of India. Headquarters of NPCI: Mumbai, Maharashtra. Founders of Flipkart: Binny Bansal & Sachin Bansal. President of the World Bank: Jim Yong Kim. Headquarter of World Bank: Washington DC, USA. Capital & Currency of Turkey: Ankara, Lira.